Don't miss this stylish used 44' Zeelander boat for sale in Florida! : Atlantic Yacht & Ship, Inc.
Don’t miss this stylish used 44′ Zeelander boat for sale in Florida! John Slate has a great deal on this beautiful used 44′ Zeelander yacht for sale! In the first place, this used 44′ Zeelander yacht for sale was launched in 2014. Additionally, she is known as “Virtuoso” with a stunning green hull. In fact, this particular Zeelander was one of the last boats built at the Tiara factory. Overall, she is in meticulous condition and turn key ready. Furthermore, she has a very rare settee / bed conversion forward! 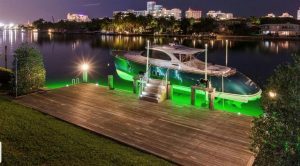 This used 44′ Zeelander yacht for sale is fully-loaded in addition to the deep green metallic hull. In fact, she is extremely fast quiet, fast, and comfortable. Easy to manuver with her IPS joystick control, docking is a breeze. Furthermore she boasts a dynamic positioning system (DPS) for flawless control and convenience. Always maintained by a professional captain results in condition you will love! This used 44′ Zeelander yacht for sale is truly the best example of a late-model Zeelander yacht for sale available. This is the newest model offered for sale in the United States! For more information on this beautiful used 44′ Zeelander yacht for sale be sure to contact John Slate today! For over 56 years Atlantic Yacht & Ship has been serving the yachting community. Our headquarter sales office is dockside at Harbour Towne Marina. Moreover in the heart of the yachting capital of the world, Fort Lauderdale, FL. Our in-house waterside service department provides general yacht services. This includes new teak, to engine rebuilds, captain services, and everything in between. Whether purchasing or marketing a quality vessel, Atlantic Yacht and Ship, Inc. is your one stop resource. AYS delivers the highest quality service and sales in the yachting industry today. If you are looking at yachts for sale, or thinking about selling your yacht, it is always wise to have an experienced broker representing your interests throughout the deal. Contact Atlantic Yacht & Ship at 954.921.1500 or click here. $25,000 price reduction on this used 44′ Zeelander yacht for sale! Check out this used 44′ Zeelander yacht for sale in Florida!